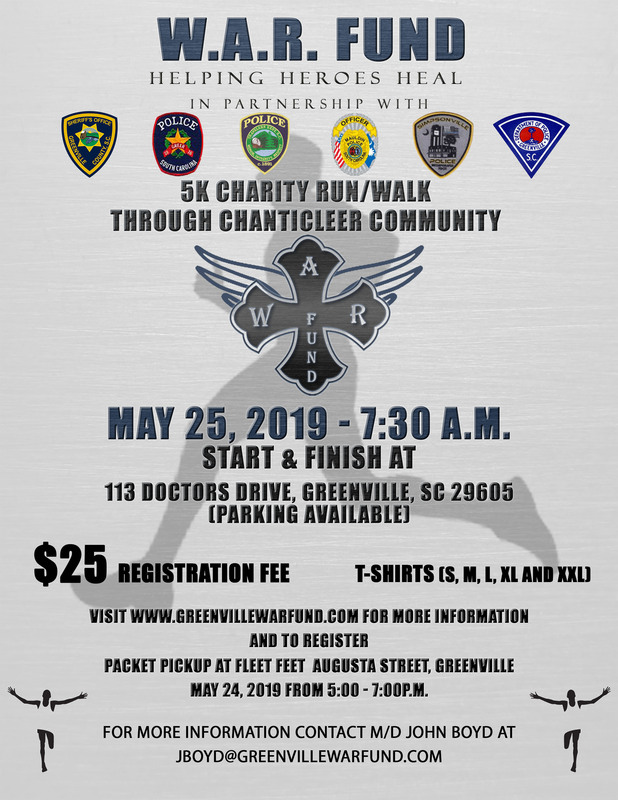 The Wounded and Recovering Fund was set up by Greenville County Deputies after several serious Line of Duty injuries in the past years. These serious injuries caused deputies to experience financial hardships after the incident due to the loss of work, secondary employment, medical bills etc. The primary goal of the Wounded and Recovering Fund is to establish permanent fundraising capabilities in an effort to provide immediate financial assistance. Every penny of your money goes towards Law Enforcement who are hurt in the line of duty. Enter the amount and click the Donate button to Donate to the WAR Fund. Thank you! The primary goal of the Wounded and Recovering Fund is to establish permanent fundraising capabilities, in an effort to provide immediate financial assistance to a Greenville County Deputy Sheriff(s) or Municipal Police Officer(s) who are injured in the Line of Duty in Greenville County, SC. The Wounded and Recovering Fund has assisted injured police officers with over $30,000 in financial support since its inception in 2012. On duty certified Greenville County Deputy Sheriff or Municipal Police Officer who, acting in a Law Enforcement Capacity; Law Enforcement Function; or taking Law Enforcement action, become injured in the Line of Duty due to the direct or indirect actions of a suspect(s) which occurs within the jurisdiction limits of Greenville County or Municipality therein; And, require monetary assistance due to loss of work, loss of secondary employment, medical bills not covered or any other related need deemed appropriate by the board. Injuries resulting from scenarios not covered in the above guidelines, ex. Training exercises or any other non suspect related injuries will be strictly reviewed by the Board. The Board shall weigh all factors such as: seriousness of injury, cause of incident, status of individual/event – voluntary, primary or secondary duty, and status of Fund finances etc. All Applications Shall be reviewed by the Board in a case by case basis who has sole discretion in approval of Funds. Potential applicants/ or designee shall submit an application and upon review by the board and a review of Gift Amounts Form will disperse money by check to the approved Recipient. "October of 2012 I was injured at work. I was out about two months and was unable to work overtime or side jobs (as most people do in my profession). This was very close to Christmas and my son was/is big in to baseball and my wife and I did not have enough money to buy him the Christmas he deserved. We weren't sure where we would get the money from until the doorbell rang with some of my brothers in blue standing in the doorway. I figured they were just coming to see me just like most of my brothers and sisters in blue have done since the injury. But they handed me a check from the GCSO WAR fund. This paid for my sons Christmas (he got a new bat that year) and helped us pay some bills. As I type this I tear up thinking about how my work family takes care of each other. The will never now how much this meant to me and my family." If you can, please donate to this cause. All the money goes towards Law Enforcement who are hurt in the line of duty. I assure you not one penny is taken from the donations. Contact us for more information, how to help the WAR Fund cause, or to inquire about how to be a potential applicant. Your message was sent successfully. We will be in contact with you soon!